Last year, I shared our Cell Phone Dilemma about our family’s decision of when to allow our kids to get cell phones. Honestly, as a parent, it’s one of the issues we struggle with the most. It’s such a personal decision for each family, but as our children get older, I’ve found that one of our hugest mistakes was allowing too much online and social media connection and I’m not too proud to yell it from the roof top to WAIT as long as possible. Even with four teenagers, we limit it a lot and it’s still too much. That’s why I am a huge supporter of pre-paid cell phone packages. Hopefully, our third child will pass his driver’s test tomorrow (yes, three teen sons on one insurance policy, oh help us), and believe it or not, he does NOT have a cell phone yet. (Yes, meanest mom ever.) He will get one after this week and it will be a Straight Talk pre-paid “All I Need” plan. When I began my blog, I didn’t even own a cell phone, but then realized that I did need more connection and got a Straight Talk phone. It served all my needs at the time (I used it for three years), and I still have so many friends that use them as a provider after sharing my experience. Straight Talk partners with existing wireless networks nationwide to provide no-contract wireless phone service and has all of the same great phones as the contract carries, including name brands like Samsung, Apple, Windows and LG. Straight Talk offers the same networks and the same phones at half the cost. Over the course of those years, it’s saved me so much money than having a traditional plan. For only, $30 a month you receive 1,000 minutes, 1,000 text or multimedia messages, 30 MB of data transfer for data phones and 411 calls at no additional charge. That was all I needed. I could check emails, respond to texts and I had no tie to a contract. Since our kids have to pay for half of their service and they also must save up at least six months of a contract before we sign for them, this is always a good option for which to begin. I love when companies give back. And not just a little…a lot! And for an amazing cause!! Isn’t that great and how very easy! It’s fast, easy and worth every second! So please take one minute and share their video today. Click here. 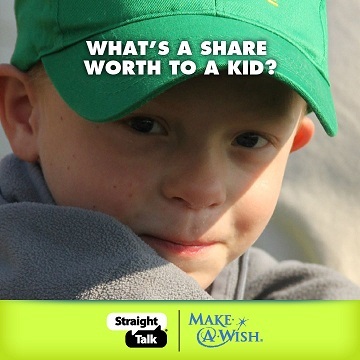 Just think of all the wishes you can help make come true by this simple act. We also made our children wait for cell phones. Our older two girls received them towards the end of their sophomore year…for their confirmation gift. We were Verizon customers at the time and it was a mere $10 to add a line to our existing plan. They shared our minutes and had NO texting privileges until they were earned. This seemed to work fairly well. However, as our third daughter got older, it became apparent that waiting until 15 was not as feasible. She was involved in sports at her school all year long. She attended a small Christian school that often had to travel long distances to play away games and the return time could be anywhere between 6pm and 9pm. She always had to ask someone to borrow their phone to let us know when they were close to the school so we could pick her up. We finally relented and she got a cell phone for Christmas when she was 13. We checked several different carriers and eventually went with Kajeet. It has been a very good experience. Her phone was on sale for $35 and our bill is $15 per month. That gives her unlimited texting and 60 minutes of talk time per month. We have complete control over her phone and have the ability to control when she can send & receive texts on their website. We were also able to add our phone numbers as numbers that can reach her at any time of the day or night. It has been a wonderful experience and I highly recommend their service to anyone with a child that wants to be able to control when their child is allowed to text. Thanks so much for sharing your experience. It’s a definite journey to navigate, isn’t it? We use Page Plus Cellular. They contract with Verizon to use Verizon towers. We pay $30/month for 1200 minutes, 3000 texts, and 250mb data. All this with no contract! We have been very happy with them. And they are located here in Ohio!